Sasha discusses everything from harmonic choices in her compositions to integrating activism into her art in a two-page interview and photoshoot. 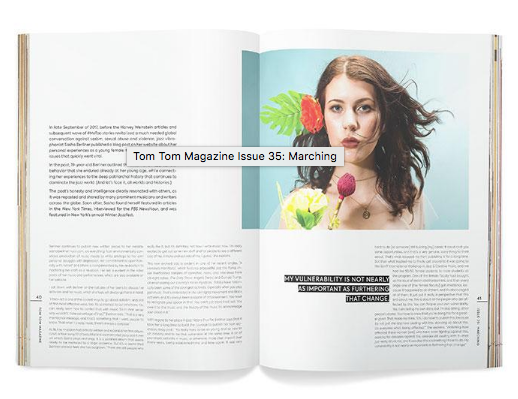 Issue 35 of Tom Tom Magazine (Fall 2018) can be purchased online via the link. Sasha Berliner is featured among vibraphonists like Joel Ross and Warren Wolf in this special mallet feature on Revive. The New York Times - "For Women in Jazz, A Year of Reckoning and Recognition"
Sasha Berliner is interviewed, among other prominent jazz musicians like Terri Lyne Carrington, Esperanza Spalding, and Nicole Mitchell, regarding the struggles of sexism and fighting for fair recognition in the jazz music industry. Sasha Berliner is interviewed regarding her musical influences, having grown up listening to primarily rock music, and about what she feels makes a contemporary artist/musician. Sasha does an interview on behalf of The Jazz Gallery’s Future Fest. She discusses everything from the nuances of harmonic choices to interdisciplinary performance, all of which she plans to employ in her upcoming performances (such as her closing performance for the festival). SF Jazz lists Sasha, among other instrumentalists like Thelonious Monk Competition winner Melissa Aldana and avant garde guitarist Mary Halvorson, as some key rising women instrumentalists to keep an eye out for in 2018. Sasha Berliner speaks about her experience performing with NYC Winter Jazz Fest and her activist mission to bring awareness to the influx of sexism that exists within the jazz world. Sasha is featured along with drummer Terri Lyne Carrington, bassist Esperanza Spalding, and activist/writer Angela Davis. Sasha Berliner and fellow SF Jazz High School All Stars female peers discuss jazz improvisation and their musical beginnings. Sasha Berliner elaborates in depth on the future of jazz and music as a whole, growing up in the bay area, and being a woman in the music industry.